I'm back to share another card using some Simon Says Stamp goodies along with color mist sprays. Once again I used Mister Huey's but have linked to various sprays in my affiliate links below. Using Simon's Extra Large Dots Stencil over Solar White Cardstock, I sprayed 4 different colours of mist. Once dry, I added some BasicGrey Decorative Brads to a few of the circles, added a strip of Simon's Black Cardstock to the bottom, and adhered the panel to a Desert Storm note card using foam tape. I then white heat embossed the sentiment from Simon's Big Birthday Wishes Stamp Set and added it to the card. Great application of those mists!! It turned out so beautifully! 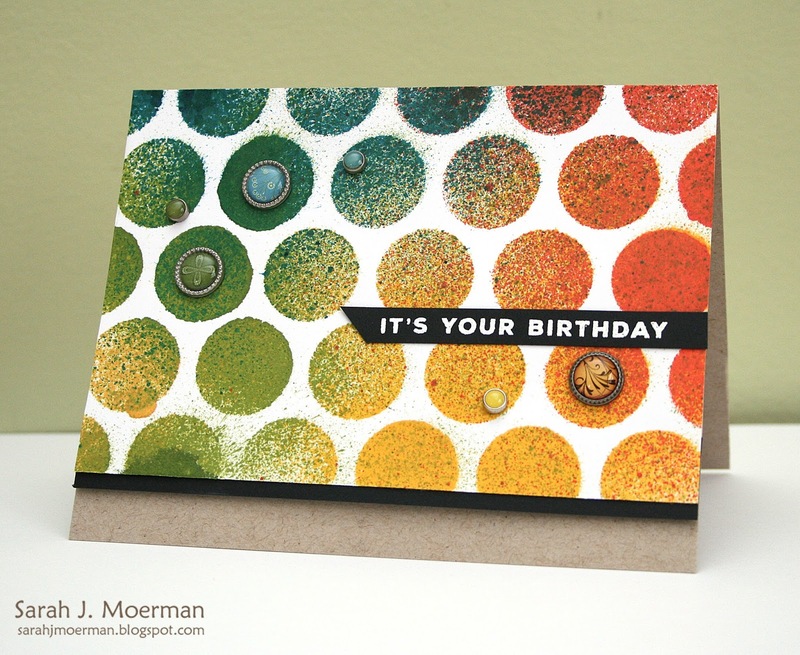 Simon Says Stamp May 2016 Card Kit Winner! Simon Says Stamp's My Favorite Release!